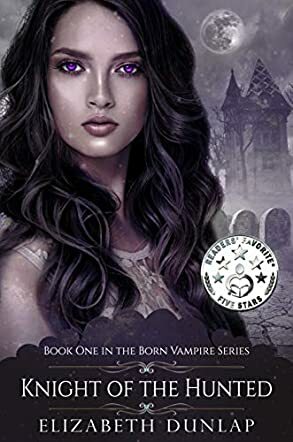 In Knight of the Hunted (Born Vampire Book 1) by Elizabeth Dunlap, Lisbeth is a 400-year-old respected Born Vampire, with the responsibility of training the humans they have ‘turned’ in the rules of vampire etiquette. When a Lycan child mistakenly wanders into enemy territory, Lisbeth breaks the rules she has always lived by and returns the child to the Lycans. Now she must run from The Hunters from her own kind, or pay with her life. Lisbeth, hungry for blood, discovers an unlikely ally in a Lycan named Knight. They mistakenly enter a town run by a callous Vampire called James, whose ultimate desire is to make Lisbeth his own and rid her of Knight. Lisbeth and Knight must use all of their knowledge and strength to try to escape James’ clutches. Together, they must learn to trust one another if they are to survive. But why is Knight away from his pack? Is he hiding from something too? From the first sentence, ‘I woke to the scent of blood in my room’, this enthralling story had me hooked. The author is a master at building unique, likeable characters that each have their strengths and weaknesses. The plot moved forward constantly, building suspense as the Hunters closed in on Lisbeth and Knight. There were some close shaves when I could not see them escaping. Lisbeth is a strong, warm-hearted character who has great morals. Knight was an absolutely terrific character; his dark humour, sarcasm and sense of loyalty were superb. There is an obvious detailed backstory to Lisbeth that I am hoping will be covered in future novels in this series. I would love to know the history behind the feud between the Vampires and the Lycans. I would also like to discover more about Lisbeth’s parents and Balthazar. The climactic ending will leave you desperate to know how the story continues. This is a refreshing look at the Vampire genre. A story of an endearing, but unlikely romance and the fight to stand up for what you believe to be morally right.